Soumya is a very old friend from my university days, and it is a special feeling to be discussing his book. In that it is indeed a discussion rather than a comprehensive review of the book, and I do not even claim to do justice to the book’s ambitious narrative and unusual analytic frame. Soumya is an extraordinary mind. He is a philosopher, a literature student, a performer, a director of plays, a teacher and now I see also a historian. The book, therefore, like he himself, is a challenge for any friend and comrade, who like me shares his passion for politics and philosophy, but thinks very differently, perhaps even incommensurably. What I shall say by way of discussing the book is then a kind of response to this intimate challenge that Soumya poses before me. First, let me present briefly how I read Soumya’s book. The book is about sovereignty – sovereignty as simultaneously political sovereignty and sovereignty of thought, sovereignty as that of philosophy on the one hand and on the other, of the king/Christ/state and eventually of that impossible, uncountable entity, namely the people. Soumya works through a series of historical moments, though not chronologically (something to which we shall come back later) – 5th century BC Greece with its theatre and its civic assemblies of gods, citizens, faceless slaves and women, 12th century Europe with its notion of Christian theological kingship, 8th-9th century Byzantium with its controversy regarding the question of the icon and the idol and the worship and circulation of the same, 18th century France with its revolution, terror and increasingly medicalised madness, and finally the contemporary with its war on terror and its democratic revolutions. Soumya’s project is to tease out histories of the constitution of sovereign power in this long story of Europe (and he shall argue the world). Soumya implies that the history of sovereignty is produced at two levels – one, as the story of the sovereign as a figure and two, as the question of the ground, the basis, the founding principles of sovereignty. The figures of sovereignty as they appear in history, and yet fail to acquire full presence and stability (which is what the whole story is about), are the Greek gods with their strategic intelligence and liturgical role, the consecrated Christian king backed by the notion of eucharist transformation that transubstantiates the inscrutable idea of divinity into flesh, and the post-revolutionary republican people, counted as a disassembled numerical order of populations and while being mobilized as the One, the singular Nation. The ground of sovereignty on its part appears in two senses. One as jurisdiction – of law, administration and taxation – that appear through history as fisc and empire and patrie, in different ways assigning a territoriality, a world-extension to sovereignty itself. The ground also appears as the ground of thinking the power of the universal, which in the history of Europe appear as philosophy and theology and in modern times, mathematics. Through what Soumya calls a ‘commensuration’ of the figure and the ground, the book goes on to show that the ground of thought is also the ground of sovereignty, the ground which underpins the exercise of both power and truth. Soumya’s story is full of fascinating moments – as when he demonstrates that the imperative of governmentality is as old as and indeed part of the imperative of sovereignty; or when he lays out the long history of tithes and taxes in Europe as a dialectic between the debt to and debt of the sovereign; or when he excavates an older history of the economy as a domain of regulation mapped by the circulation of Christian icons, making the economy into God’s worldly plan for the salvation of mankind. We do not have time here to dwell on these details, though each of these by itself can be major point of discussion. I shall only mention here that in Soumya’s imagination, all these discrete moments make up what he calls an ‘inconsistent’ history of sovereign power, i.e. a history without unity or necessity. This means, in my understanding, that no straight-forward chronological or successional history is possible for sovereignty, precisely because the career of sovereignty is also repeatedly a history of its siege, its failure, its dysfunctionality – the manifestation of the groundlessness, the voiding of sovereignty, despite its cunning, its ruses and indeed its claim to truths. In that sense, despite its historicity, sovereignty, at different times must be set up anew, following its own failure. The place of the French Revolution in the book is precisely to show up such a moment of the failure of sovereign power and of the difficult search for a new ground and a new figure of sovereignty, namely the people. As Soumya shows through his reading of Michelet’s history of the French revolution, it is not as if forms of sovereignty, power and truth make successive paradigm shifts in a long history of political society, but that everything must be recommenced, the present reinvented every time, by rewriting once again its past and its future, following upon the defaulting of an earlier form of sovereign presence. Soumya’s account of the career of sovereignty is persuasive in its own terms, but in my eyes, the account comes up against a critical unresolved question – namely, the question of the relationship between history and philosophy. Soumya imagines this relationship as a kind mismatch – sometimes there is the glimpse of geological metaphors, a faultine, an abyss – between the metaphysics of truth and the structure of possible actualisations of power, between the philosophical mandate and the historical logic. It is this perpetually restless, quaking faultine between history as actualization and philosophy as the axiomatic instance, as he aptly calls it, which causes what he calls torsion, a violent twisting, of thought – a torsion through which thought moves as it were. In my reading, however, this formulation retains the place of history and the place of philosophy somewhat undisturbed, even though teetering on both sides of the abyss – while I would have thought that it were precisely those places, those habitations of history and philosophy that would come under question in his account. My feeling is that this is because Soumya does not face squarely the different ways in which modern western philosophy has harnessed history to itself – or the ways in which history and philosophy have sought to take each other’s place through time. Of course, in modern times and with Hegel, history itself – world history to be precise – was transfigured into a philosophy of global sovereignty. But even if we consider the Hegelian moment passé, there is another way in which philosophy continues to harness history to itself even today. In the western tradition, philosophy operates as always already history of philosophy, through which not only is an exclusive philosophical canon set up, but more importantly a strange contemporaneity is set up amongst philosophers of diverse times and contexts, from Plato to Marx, from antiquity to today, such that thought appears to undo its own historicity and assume an infinite, universal and eternal form, becoming in a way thought unto itself. In other words, in this tradition philosophy becomes its own history in such as way as to pitch itself beyond the ephemeral and the contingent – that being the truth-procedure of western philosophy itself. And even when a contemporary philosopher such as Alain Badiou – who seems to hugely influence Soumya – grants autonomy to history, he does so in the name of the Event with capital E – making true history incumbent upon emblematic dates, exceptional events and proper names. But this precisely is the imagination of history against which subalterns have had to struggle incessantly, in the name of long durations as well as contingencies, of the everyday and the quotidian, of the anonymous and the defeated. All this is not to argue against Soumya’s effort at bringing philosophy and history together within the same frame. On the contrary, that is exactly the importance of the book. This is only to say that one cannot any longer presume to be innocent about the close complicity, and not just the antagonism, between history of a kind and philosophy of a kind. Indeed, one cannot be innocent about history itself, and I do sense such an innocence in Soumya. One cannot presume, in obedience to Badiou, that the event with capital E will show itself inexorably and obviously and force new thought, new truths, and new subject-bodies who appear purely in fidelity to the event. Instead, it is in the very process of historicisation, in the assigning of a new past and a new future to it, that an event becomes an Event. In other words, it is precisely through new periodisations that politics moves – as our experience with the regime of the modern tells us at our own peril. I think it is critical the way Soumya makes the choice and arranges the sequence of his historical instances – whether Greece or Byzantium or France, whether classical, medieval or modern. But he hesitates to make the political stakes in his choice explicit. I also think that he is too quick in the way that he extrapolates a global paradigm of sovereignty from these very particular and local European instances. I am not quite certain that this seamless passage into the global is not the residual conceit of philosophy itself – even if this philosophy is humbled before the contingency of the event. But Soumya does make a critical move away from the Badiou-kind of history-philosophy problematic – not only because he seeks to theorise sovereignty (taking Foucault on board, Foucault whom Badiou does not consider a philosopher) rather than truth or being or subjectivity, but also because he inflects his story of philosophy and history by a third entity – namely, theatre. He does not use quite use theatre in the way that Badiou or Ranciere or Virno does – by raising questions of spectatorship, passivity, agency, publicity, community so on i.e. by making the question of theatre isomorphic with the question of politics itself. Soumya invokes theatre from perspective of theatre itself, but he also does not reduce it to a generalized notion of performance which leads to trite observations such as politics is performative and so on. Soumya counterpoises theatre with philosophy, and I shall add also history. This is because theatre dislodges both the philosopher’s truth and the historian’s real. As Soumya says, theatre puts forth the mask, the actor’s mask, which is in a disjunctive relationship with any natural, ontological or legal position. Theatre also displaces the map of subjects and objects by distributing figures on the stage merely though a logic of positions rather than through epistemologics. In that sense, Soumya reconfigures the history-philosophy binary into the evocative triad of history-philosophy-theatre. But once again, Soumya does much less with theatre than he promises, tantalizingly, in the beginning of the book. At the very end of the book, however, he quotes a long passage from Antonin Artaud, where he says (and I quote from the quote) “Once the plague is established in the city, normal order collapses. …At this point, theatre establishes itself. Theatre that is to say the momentary pointlesslessness which drives people to useless acts without immediate profit or point.” This Soumya proposes is a moment of exception to both the law and the liturgy of sovereignty – leading to a kind of activation beyond the limits of civic and cultural participation. 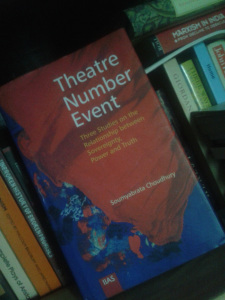 I really wish that Soumya would write more on this other notion of action and subjectivity that theatre helps us imagine. Prathama Banerjee is Fellow, C.S.D.S., New Delhi. She is the author of the book Politics of Time: Primitives and History-Writing in a Colonial Society, published in 2006.